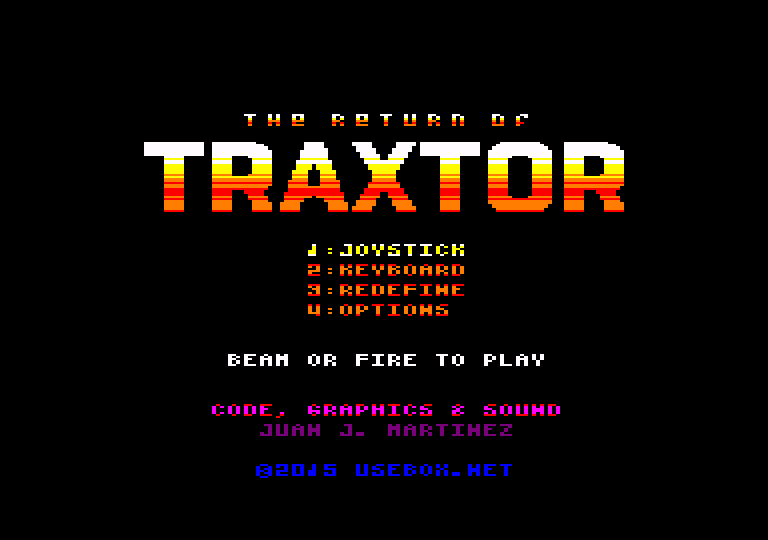 This is a version of my original game for ZX Spectrum 48K (The Return of Traxtor) for the Amstrad CPC 464 (or later). You can watch some game play footage (spoilers!). The game was reviewed at CPC Game Reviews (score: 9). The game can be controlled with the keyboard or a joystick (GX4000 gamepads should work nicely). Default keys can be redefined in the main menu. Select joystick and keyboard again to reset configuration to the default keys. During the game, press ESC to leave the game and return to the menu. Modes: normal and easy; this adjusts the difficulty of the game. Tiles: classic or alternative; in case you’re using a green monitor or if you have problems to see the colours of the classic tile set. Music: on or off; to disable the background music during the game play. Jukebox: can be used to play all the songs of the game. Use the tractor beam to move blocks into the bay, and fire to throw back the top-most block to the board. Match 3 or more blocks to destroy them before they reach to your defence line. Wildcard blocks can be thrown to any block type and they will turn into that type. 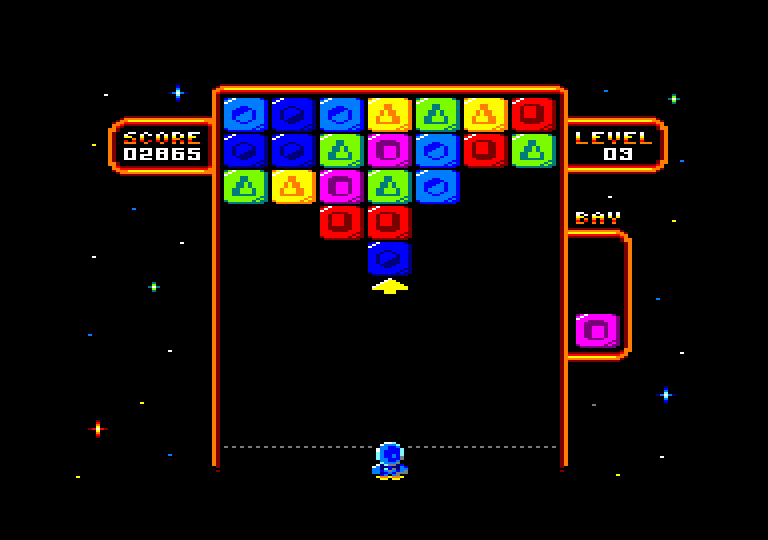 You can throw more blocks into already exploding blocks and if the colour matches, it’ll score extra (combo). Combos will help you to get faster to the next level. When a block is not attached to the top of the playing area or to another block, it will fall. You can use that to help you to clear the board! When the board is cleared, you’ll get extra bonus points and immediately level up. Every 5 levels, the blocks’ speed will slow down a bit. Current version is 1.1 (2016-03-05). Includes a loading screen based on the ZX Spectrum version by Craig Stevenson.